The varsity sports awards were held on June 4th in the Performing Arts Center at FHS. Teams and individuals were recognized for their outstanding performances on the field and in the classroom. Over one hundred students earned scholar athlete awards. Seventy seven students earned post season honors in their sport, including twenty eight All-County honors and eight All-State honors. Our girls’ basketball, cheerleading, football, boys’ soccer, and baseball teams qualified for the playoffs. Our soccer and baseball teams hosted their first playoff game in over a decade. The girls’ basketball team made it to the final four, the football team finished as Nassau County finalists, and of course, our cheerleading team won the Nassau County Championship and placed 5th in the State Championship. Student athletes at Dodd and on JV teams were celebrated during their sports awards as well. Congratulations to the sixteen wrestlers who qualified for the Nassau County Championship, held February 10-11 at Hofstra. The team finished 3rd overall in the county. Seven students placed. Lee Mauras earned a wild card seed and qualified for the NYS Wrestling Championship, which will be held in Albany, New York February 24-25. The Freeport cheerleading team competed on February 10-11, at the UCA Nationals and qualified in group B of the semi-finals with a score of 83.8 and 5th place out of twenty-two teams. In the semi-finals, the team scored an 84.1. Fourteen teams out of twenty-eight made the final; Freeport placed 16th, missing by .07 points. This was the first Freeport team in history to make the semifinals and they received two of the highest scores ever in a UCA event. The team’s performance in semis, “rocked the new Cheer arena at Disney's Wide World of Sports,” said coach Laurie Kolodny. Coaches Laurie Kolodny, Erica Groover and Christina Prisco are proud beyond belief! “The last month had been an incredible time for us. We've come to nationals hitting our last 3 routines and to put those routines on the mat was exceptional!” Moving forward this season, Freeport is ranked #1 going into counties which will be held at Wantagh HS on Sunday, February 25. Good luck to the team as the competes for a trip to the State Championships! Freeport High School teacher Meredith Jones received the 2017 Secondary Physical Education Teacher of the Year Award by the Nassau Zone of New York State Association of Health, Physical Education, Recreation and Dance. She was recognized for her outstanding achievement as a physical education teacher at a ceremony held at Adelphi University on June 12, 2017. Pictured left to right: Jonathan Bloom, Director of PE, Health & Athletics, Jackie Beihoff, Awards Chair, Meredith Jones, PE & Health Teacher, and Tara Nelson , Nassau Zone President. The Freeport Cheerleading program hosted its 17th annual competition on January 28 at Freeport High School. Fifty eight teams from all over Long Island competed in the event. Hauppauge won the Small Varsity D1 division with host Freeport bringing down the house with their incredible performance placing 2nd, Wantagh 3rd, MacArthur 4th and Sachem North 5th. "The energy in the gym during this competition was electric. While Freeport was performing, it was like you could feel the gym shake. They were that incredible," coaches Laurie Kolodny and Cheryl Gayle said. "This is the absolute best performance any Freeport team has done by far in years. We couldn't be any prouder of our girls. Thank you to all the families, friends, administrators, Board Members and cheerleaders for making this competition a huge success." Congratulations to the varsity football team on winning the Long Island Class I Championship for the 5th time! 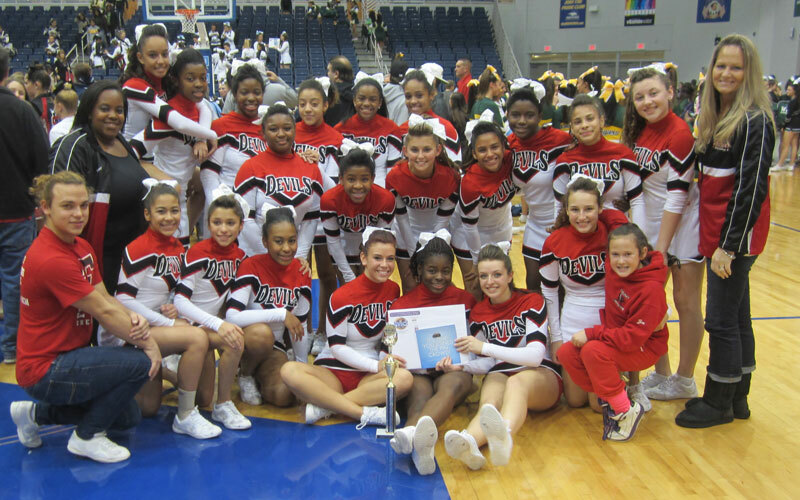 Congratulations to varsity cheerleading team on placing 4th at the Kutztown Regionals and earning a bid to Nationals! Congratulations to Shannon Welcome for winning the 200 Freestyle at Counties and qualifying for the State Championship! On April 13, 2016 Freeport High School hosted the first Nassau County Cheerleading Awards. Grace Anner earned All County, All Long Island and Scholar Athlete honors. Avery Taylor received All Division honors. Katherine Leon earned the Coaches Award and Laurie Kolodny received the Coach of the Year in Nassau County. Congratulations! The Freeport Varsity Cheerleaders placed 4th out of 25 teams in the Small Varsity Division at the Pocono Regional held at Kutztown University in early December. They earned a bid to the National Championships in February at Walt Disney World. Coaches Laurie Kolodny and Cheryl Gayle said its been big adjustment not only with Cheerleading becoming a sport this year, but because the team made the jump from Super Varsity to Small Varsity. The girls are very talented and work hard every day at practice. 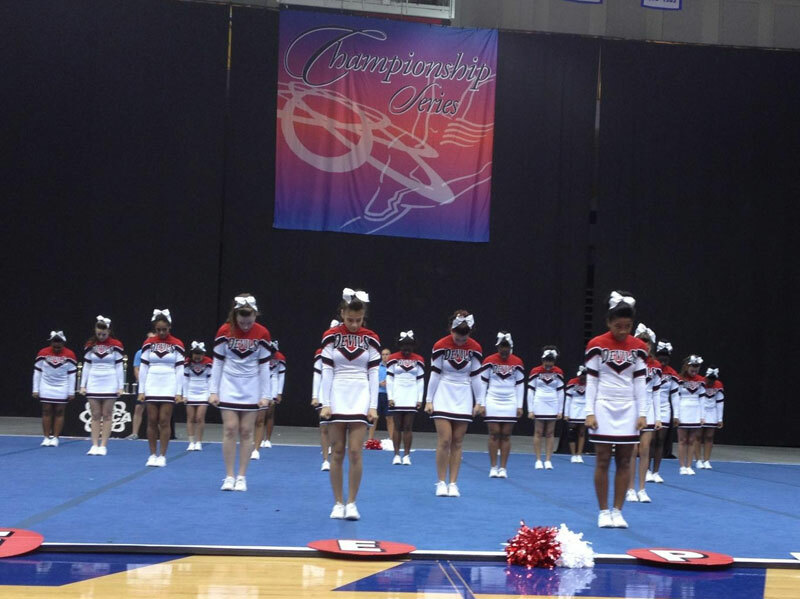 Our goal this year is to make it to the County Championships and to make finals at Nationals! Congratulations and good luck to the girls and coaches as they continue their competition season! Shannon Welcome, a 9th grader, has qualified for the New York State Swimming Championships in the 500 yard freestyle event, which will be held on November 21, 2015 at Ithaca College. This past season, she set new school records in the 500 yard freestyle, 200 individual medley and 100 yard butterfly events. She also earned All-County/All-Conference honors. The relay team of Shannon Welcome, Shanice Welcome, Anaiya Matthews-Correia and Josephine Iaccarino earned All-Conference honors in both the 200 medley relay & 200 yard freestyle relay, as well as their individual events. Freeport Defeats Calhoun in OT! The #13 seeded Red Devils defeated the #12 seeded Calhoun Colts by the score of 2-1 in overtime. The game was decided on penalty kicks. Next up, Freeport at Syosset, Saturday, October 24th at Syosset. To receive the latest Freeport Athletic updates and game cancellations via text, Text @freeporta to 81010. Freeport High School’s new spin room was unveiled in the spring to the delight of students, staff, administrators and elected officials. The room was one of the second-year projects to be fully supported by the Carol White Physical Education Program grant, a three-year award from which the district has received nearly $800,000 thus far. The room cost approximately $75,000 to complete, and no tax dollars were used. Other second-year projects funded by the grant and completed this year included approximately $20,000 in renovations to the greenhouse (replaced glass, tables, door, electric and irrigation, etc. ); expansion of the Youth Empowerment Seminar program, which includes two full-time YES instructors at Dodd, meditation professional development, and sending three teachers to be trained for the program in California; adoption of the SPARK curriculum plus full school curricular materials; incorporation of technology in the physical education department, including five portable interactive boards, Apple TVs, iPads for all teachers, IHT heart rate monitors with software and an Xbox class pack; sending 18 students with disabilities to participate in the six-week HorseAbility program; sending Archer's fourth grade classes to participate in a Project Adventure program in Old Brookville; arranging for staff professional development including training for iPad use, two full-day SPARK training days, Fitnessgram training, full-day Focused Fitness training, sending 19 staff members to the Nassau Zone Conference at LIU Post, and sending one teacher to the National Physical Education Conference in Seattle; and installing six new basketball hoops on the Atkinson playground. Various dignitaries attended a ribboncutting ceremony for the new spin room in May. Students and staff joined Superintendent of Schools Dr. Kishore Kuncham, Board of Education President Michael Pomerico, Principal Linda Carter, Athletic Director Jonathan Bloom and Director of Facilities Thomas Fucci to celebrate the spin room’s grand opening. The room features dozens of spin cycles, as well as a surround-sound system and television screens to fuel workouts. Elected officials in attendance included Town of Hempstead Councilwoman Erin King-Sweeney and Legislators Laura Curran and Steven Rhoads. For six weeks in the spring, a professional spin cycle instructor hosted classes twice a week for students after school. The room was filled to capacity every session. The spin room’s integration with the physical education department introduces a new element to the school’s physical education curriculum and also promotes the district’s ongoing dedication to teaching its students the importance of a healthy lifestyle. The 2014-15 school year was a widely successful one for the district’s student-athletes, teams and athletic program. Ten of the district’s varsity teams — girls soccer, girls tennis, badminton, cross-country, girls indoor track, girls outdoor track, girls lacrosse, girls swimming, rifle and girls bowling — qualified as New York State Scholar-Athlete Teams. To qualify for this distinction, the average GPA of student-athletes on a varsity team must be 90 percent or higher. With an unweighted average of 90 or better during their season, 141 students qualified for the All- Academic Team. The varsity football, boys basketball, girls basketball, bowling, girls tennis, badminton, and winter and spring track teams all qualified for postseason play. Eighty-five athletes were recognized for their achievements at the county and state levels. Additional athletes were recognized at the conference, division, class and league levels. The success of student-athletes and teams was not only a testament to their determination to compete and succeed at the highest levels, but also to the dedication of their coaches and the district’s athletic department. Congratulations to Taylor Miller for earning All-Conference AA-1 Girls' Basketball Player of the Year, All County, BCANY Scholar Athlete and Academic All-State. Taylor has made a verbal commitment to accept a basketball scholarship at Queens College. A complete listing of all our student athletes who have accepted athletic scholarships for the fall will be posted shortly. Student athletes from the winter season were honored for their outstanding achievement at the March 26th Board of Education meeting held at Freeport High School. Brianna Taylor finished 2nd in the 55 and 300 meter events at the Conference Championships. She competed on the intersectional relay team at the New York State Winter Track Championships at Cornell University. The team finished 6th. Brianna earned All-Conference honors this year. Alyssa Wiscovitch, Darlin Oliva and Anthony Brennan competed at the New York State Rifle Championships at West Point. The Section VIII Rifle team placed second in the cartridge division. The Freeport team also earned most improved rifle team in the county. Alyssa and Darlin earned All County honors this year. Alyssa is a Scholar Athlete – meaning she carried a 90 or above avg. during her season. ships in Albany, NY. He finished in 6th place. Julius earned All-State honors this year and is a Scholar Athlete. Yalitza Rodriguez competed on the Section VIII All Star team at the New York State Bowling Championships in Babylon, NY. The team came in 6th place. Yalitza earned the Sportsmanship Award and All County Honors and is a Scholar Athlete. She was named top bowler at the holiday tournament and won the Long Island High School Doubles tournament with partner Kaylinn Ellis. Jonathan Ruiz finished in the top ten at the Nassau County Swimming Finals in the 100 fly event, held at the Nassau County Aquatic Center. He set a new school record in the 200 individual medley and earned All County Honors. He was also voted as the Conference 3 swimmer of the year by the coaches association. Kerrian Harvey and Jonathan Valerio have been selected as our 2013 Outstanding Physical Education Student award recipients. Each year, two seniors from every Nassau County school are selected by their high school physical education staff on the basis of scholastic leadership, physical performance, physical fitness levels, services and leadership abilities. The awards dinner was held at the Crest Hollow County Club on Monday December 16, 2013. FHS seniors Davelle and De’ja Hooks have been selected as the October Honorable Mentions for the Melrose MVP Scholarship program. On November 2, 2013 seniors from the varsity football and cheerleading team's and their families were honored at the last home game of the season. The Red Devils beat Plainview by the score of 48-2. On October 30, 2013, Shannon Welcome, a seventh grader, broke the Freeport High School girls’ swimming record in the 100 yard butterfly with a time of 1:07:35. The record was previously set in 1997 by Eli Papayanopolous with a time of 1:10:68. Shannon has qualified for the Nassau County Preliminaries in both the 100 yard butterfly and 200 yard individual medley. 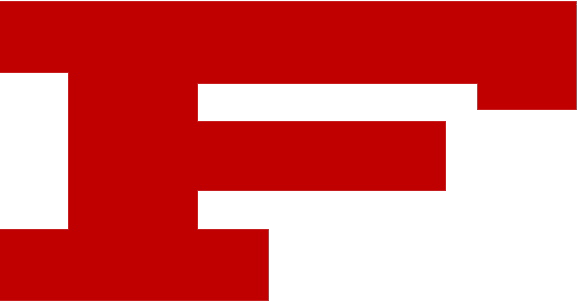 On Saturday, December 19, eighteen members of the FHS Varsity Baseball team volunteered to help three Freeport families whose homes were damaged from Hurricane Sandy. The team helped remove debris and transport supplies. 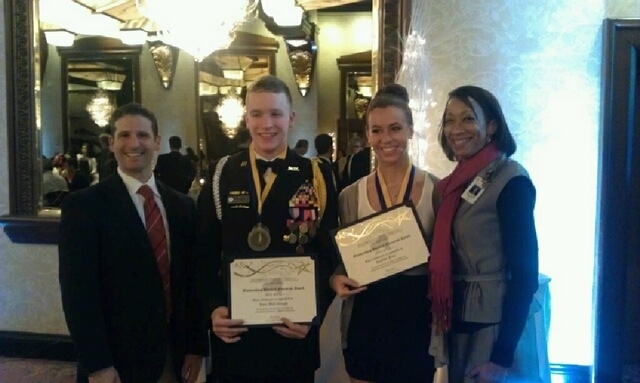 Congratulations to Kaitlyn Frey and Kyle McCullough for being selected as Freeport High School’s 2012 Outstanding Physical Education Student Award recipients. Each year, two seniors from every Nassau County school are selected by their High School physical education staff on the basis of scholastic leadership, physical performance, physical fitness levels, services and leadership abilities. 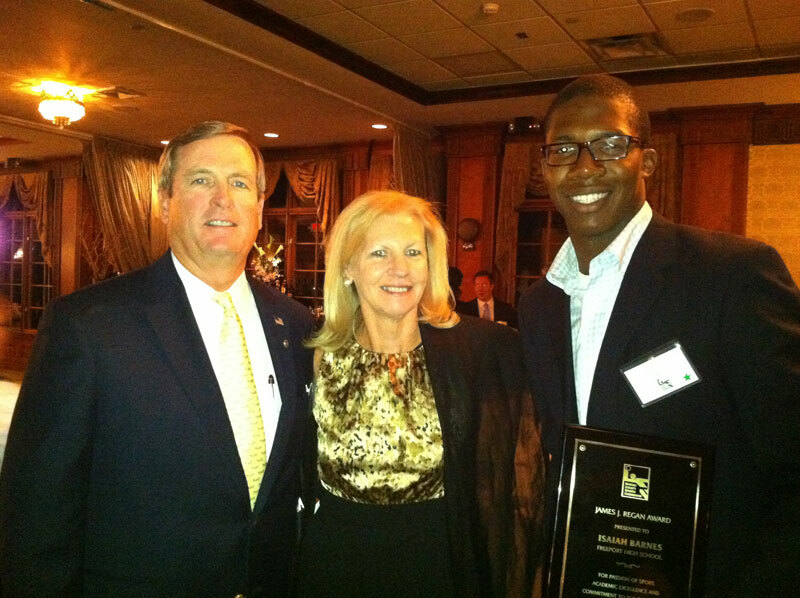 The awards dinner was held at the Crest Hollow County Club on Monday December 10, 2012. Pictured above (L-R) are Director of Health, Physical Education & Athletics Jonathan Bloom, Kyle McCullough, Kaitlyn Frey and Freeport High School Principal Linda Carter. Congratulations to the Freeport Varsity Cheerleading team for placing 4th in the Super Varsity Division at the Empire Regionals on Saturday, December 8th at Hofstra. The team earned a Bid to the 2013 National Championships in Orlando, Florida in February. Coaches Laurie Kolodny and Cheryl Gayle are so proud of all the girls and said that "The team worked harder then ever the last few days and really put their hearts and souls out on the mat for the judges. They hit their routine and gave it their all in a very tough division." The team will be working extremely hard to add tumbling and difficulty to their routine in the hopes of bringing home a trophy from Nationals! Congratulations and good luck to Freeport Varsity! Umari Taylor and Rashard Tucker (pictured above) will be participating in the Offense-Defense Bowl Game, held at Reliant Stadium in Houston, Texas. The game(s) will take place December 26, 2012-January 1, 2013. Both student athletes are 8th graders attending JW Dodd Middle School. Both student athletes were selected to participate after trying out at a Summer Camp this past July. Rashard played in the game last year as well. Congratulations to the Boys' Varsity Tennis Team for winning Conference 4B with a 14-0 record and for being a NYS Scholar Athlete Team. Joseph Chetti was named Wrestling Coach of the Year in Conference 1A. 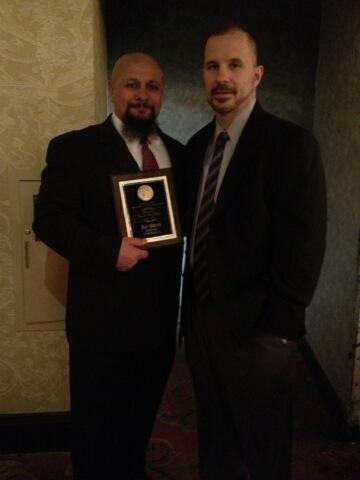 Coach Chetti was recognized at the Nassau County Wrestling Dinner, held at the Crest Hollow Country Club. Congratulations to the Girls’ Varsity Bowling team for winning Conference 5 for the second consecutive year! Congratulations to Jonathan Greenwood for winning the 300 meter and 600 meter runs at the Nassau County Class A Championships. 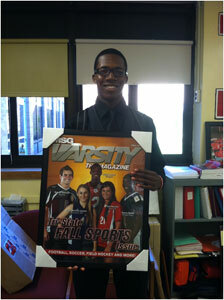 Congratulations to Maurice Irby for winning the Nassau County Wrestling Championship in the 132 lb. weight class. 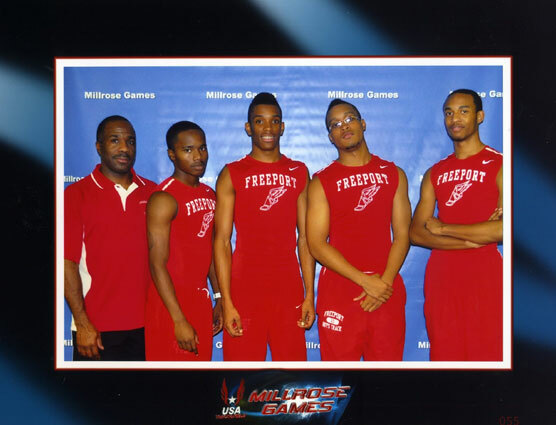 Congratulations to the boy’s 4 X 400 meter relay team for qualifying for the prestigious Millrose Games. Pictured (L to R) Coach Charles Gilreath, Tremaine Devore, Jonathan Greenwood, Caleb Jenkins and Justin Grant. 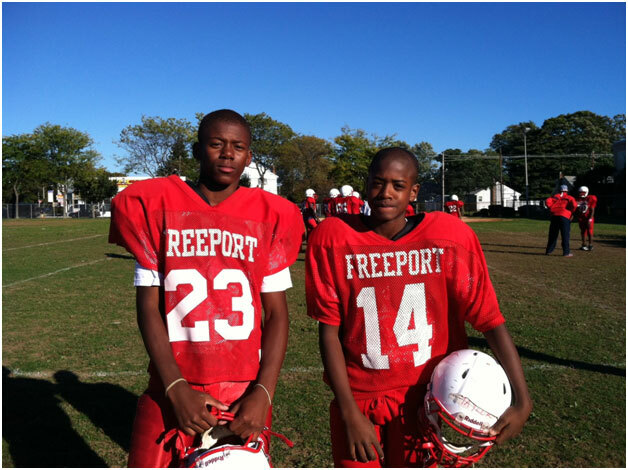 Isaiah Barnes and Jere Brown for making the All-Long Island Football Team. Girls’ Soccer, Girls’ Tennis and Girls’ Swimming qualified as NYS Scholar Athlete Teams. 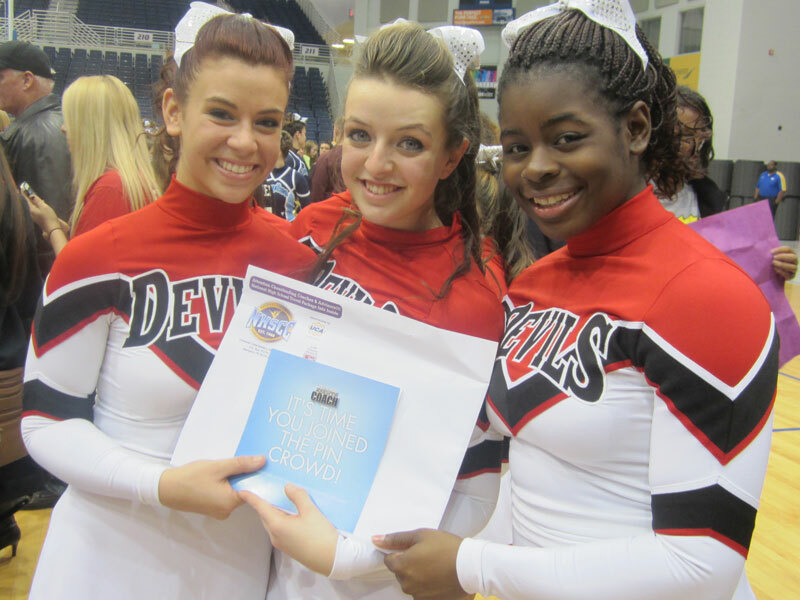 The Varsity Cheerleading team placed 3rd at the Eastern Regional’s and earned a bid to the National Championships. The Girls’ Varsity Volleyball team earned the Sportsmanship Award in Conference AA-2. Congratulations to Coach Tracie Roberts and senior Giselle Ortiz. Coach Roberts was recently named Conference AAIII Coach of the Year. She has guided the varsity girls' soccer team for ten years. The team finished with a 8-4-2 record this year. Giselle Ortiz earned All County honors and was recently named the Conference AAIII Player of the Year. Giselle scored 16 goals this season and has accrued 59 goals during her five year varsity career. As the starting midfielder, she has received multiple team awards, two Nassau County All Class Awards, and was chosen Nassau County Player of the Month in October 2009. Giselle is an Iron Man recipient (Soccer, Bowling and Badminton). She also serves as a peer tutor at FHS and has a weighted average of 95.29. Russ Cellan received the High School Coach of the Year Award at the 16th Annual Nassau County Sports Commission’s “Salute to the Champions ” Awards Dinner on May 3, 2011 at the Woodlands Country Club. Over the past 24 years as head coach, Cellan has helped lead the Red Devils Football team to five Rutgers Cups, four Long Island Championships and six Nassau County Championships. Coach Cellan attended the event with his wife Sharon, pictured above.